sorry to bother you at the end of the year. I have a big problem with all of my forms. Since yesterday the system doesn't send Confirmation Mails to people who sign up for my courses. I didnt change anything in the email notifications. I do get a confirmation when someone signs up to my courses. Please help, I don't find the error. My mail Account is hosted by 1und1.de. If I make a test registration to one of my courses using my 1und1.de hosted email account. the customer gets no mail notification after signing up. But I do get a notification that someone signed up! When I make a test registration using a Yahoo hosted Mail adress, everything works fine. Both, me and the customer are getting a mail notification. Maybe the 1und1.de mail mail servers are on a "Blacklist" ? Please help me, I did not change anything in the email notifications in my form. Upon checking your form, I see that you've configured it to use one of your own email addresses. Since you already checked with another Yahoo email account and everything worked ok, then the issue it's probably related with this specific email address. 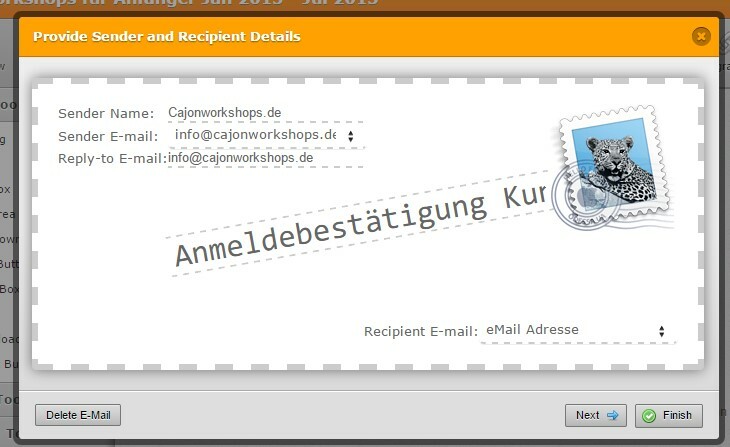 I suggest that you check the email address info@cajonworkshops.de. Check if it's not over quota or maybe accidentally disabled or maybe someone changed the password to access this account. Also, you can try to use it to send a direct email to another email address that you can check to see if you receive an error while doing it. Since you're using your own SMTP configuration what our system do is use the provided credentials to send the emails.